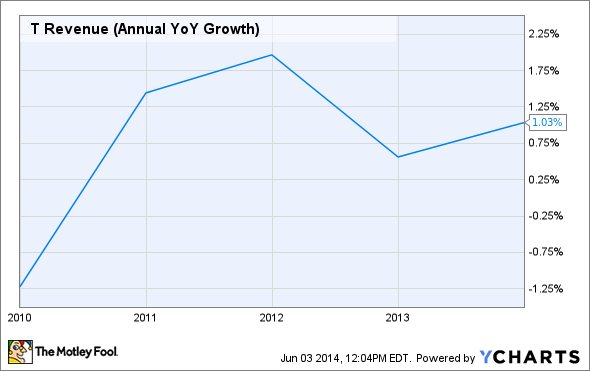 What's Wrong With Verizon Communications Inc. Today? Verizon shares are reeling from a slap delivered by archrival AT&T. But Ma Bell isn't exactly gaining what Verizon lost. What's going on here? Verizon Communications (NYSE:VZ) is one of the Dow Jones Industrial Average 's (DJINDICES:^DJI) worst performers again. The stock fell 1.3% in Tuesday's afternoon session. The Dow itself is down 0.14%. And here's the most interesting bit of all: Fellow Dow telecom AT&T (NYSE:T) is also trading 0.5% in the red. Why is AT&T's modest slide so curious? Because Ma Bell arguably caused Verizon's pain today -- and isn't gaining anything for itself. Verizon isn't completely news-free today, but all of its updates are relatively minor and should land in the "plus" column for the stock. There was no analyst action on the stock this morning. All quiet on the Wall Street front! But AT&T just updated its second-quarter guidance, and seems to be stealing business from somebody. Assuming that Verizon would be Ma Bell's largest victim, that's positive news for AT&T and negative for Verizon. Makes sense all around, right? Except, as I explained earlier, AT&T isn't rising as it should. So this can't be the whole story. Luckily, AT&T made it easy to find the missing piece. T Revenue (Annual YoY Growth) data by YCharts. But AT&T is pulling in customers with a costly trick. The AT&T Next handset upgrade program and the Mobile Share Value service plan turned out to be very popular. About half of the company's smartphone sales in the second quarter should have Next options attached. Combined, these two tendencies are pressuring AT&T's average revenue per user, with high growth in handset sales but stagnant service plan revenue. That's bad for margins, and AT&T set a new full-year earnings growth goal of "low end of the mid-single digit range." Interpreting this as maybe 4% year-over-year earnings-per-share growth, you'd land somewhere around $2.60 per share. Analysts currently expect $2.69 per share, just above management's original guidance. Sooo ... Verizon suffers as AT&T shows up with an attractive subscriber-magnet deal. It's only fair to assume that Big Red is on the losing end of that balance shift. At the same time, those new customers turned out to be costly indeed. So it's more of a mutual sinking feeling than a seesaw with one stock going up and the other down.